Melanocytic nevus of the face is a unique form of congenital nevus, fortunately rare and typically hair-bearing. These lesions have a relatively high risk of becoming malignant. They develop probably between 40 days of gestation and six months in utero. Genetic mechanisms may account for familial aggregation. These lesions, when large, make a formidable undertaking in view of the lack of suitable donor sites and multiple procedures involved in its treatment. Melanocytic nevus of the face is a particular challenge to a plastic surgeon not only because of a very high standard of skill required but also for the patient and parental concern for cosmetic results. We present a case of melanocytic nevus in a six-year-old female child which was surgically treated. A six-year-old female patient was referred to the Department of Oral and Maxillofacial surgery with a chief complaint of swelling on the right upper eyelid from past two years. Examination of the patient revealed soft, well-defined swelling over the right upper eyelid [[Figure 1]a and b]. Swelling was small in size initially which gradually increased to a size of 6 Χ 3 cm and was non-tender, mobile, non-pulsatile, non-compressible and soft in consistency. The lesion involved the right upper eyelid extending on to the right medial canthus region but the normal function of both the eyelids was intact. An incisional biopsy was subsequently performed, providing a diagnosis of benign melanocytic nevus. The child was planned for surgical management under general anaesthesia. 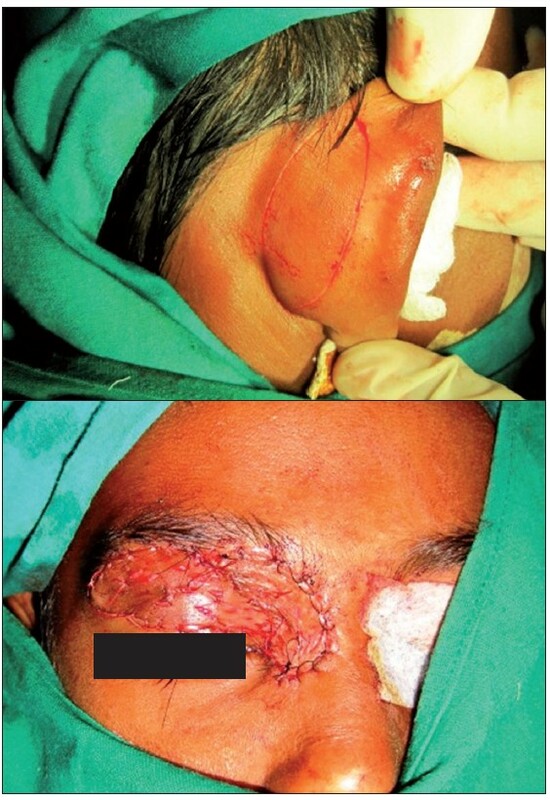 The lesion over the right upper eyelid was excised preserving a margin of 1 mm at the lid margin [[Figure 2]a and b] and the skin cover was provided by a full-thickness skin graft obtained from right post-auricular region which was defatted and the dermis trimmed to reduce the bulkiness of the graft so that the cosmetic as well as functional outcome would be better [[Figure 3]a and b]. The graft donor site was closed primarily. The graft take-up over the recipient site was 100% with excellent colour match [[Figure 4]a and b]. The patient was discharged on the second postoperative day in a satisfactory condition. The surgical specimen measured 6 Χ 2.5 cm, with irregular surface but was well circumscribed. 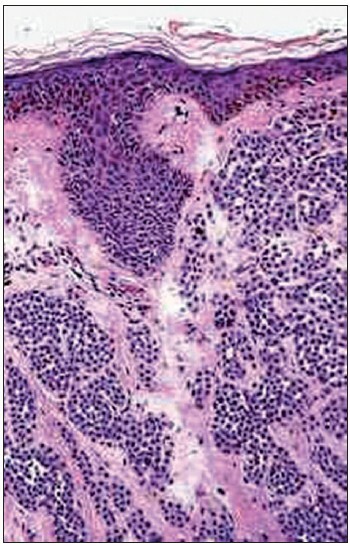 Histopathology revealed varying proportions of melanocytic nevus cells only within the dermis [Figure 5]. Based on the microscopic observations in correlation with clinical features, a final diagnosis of congenital melanocytic nevus was made. There was no impairment of the function of the eyelids or recurrence up to six months and patient is under regular follow-up. Congenital pigmented nevi are present in approximately 2-3% of neonates. Fewer than 10% of these lesions are larger than 3 or 4 cm, a size cut-off below which the designation small is usually given. It is now well established that congenital nevi and malignant melanoma are associated, despite the fact that the magnitude of risk of malignant transformation is still the subject of wide controversy. , Widely divergent figures range from 1.8% to up to 45%. A recent review on the subject has calculated an 8.52% incidence of melanoma developing within nevi larger than 2% of the total body surface during the first 15 years of life. Despite the controversy, many clinicians agree that prophylactic excision of all giant and large hairy nevi is indicated. The opinion that complete prophylactic excision of all congenital nevi should be accomplished in infancy and early childhood is well supported in the literature by the evidence that 60% of the malignancies developing in these lesions present in early childhood. In one series, 10 to 20 malignant melanomas arising in congenital nevi were diagnosed before three years of age. In addition, concerns about lack of parameters to predict as to which nevi are susceptible to malignant transformation, compounded with the fact that the diagnosis gets delayed and the course in case of a malignant change is invariably fatal are reasonable. A recent review has concluded that an early aggressive approach to these lesions is responsible for the low risk of malignant melanoma reported in various series. , Surgical excision results in the debulking of tissue at risk for the development of malignant melanoma. Agreeing that early prophylactic excision is indicated but actually accomplishing it has posed a major management problem for most clinicians. 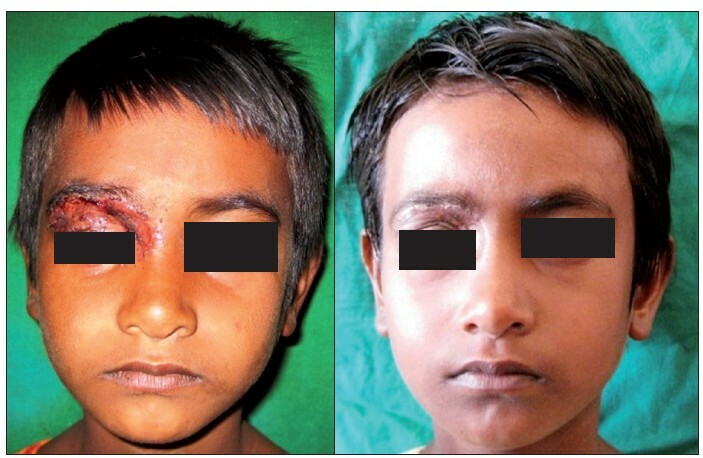 Large pigmented nevi of the face present a major deformity for the child and his or her parents. It is also a major challenge for the treating plastic surgeon to plan and achieve the best cosmetic results. There is complete consensus that the percentage risk of malignancy in these cases is fairly high. Complete early prophylactic excision of these lesions is warranted and should be accomplished in infancy or early childhood. The most common complications of eyelid reconstruction causing true functional impairment are ptosis, or the creation of a droopy upper eyelid and lagophthalmos, or tissue shortage preventing adequate closure. Management may require multiple surgical procedures. Tissue expansion forms the most widely used modality of treatment. , Timely use of other modalities like full-thickness skin grafts and expanded flaps will decrease the number of stages of surgery while minimizing the risks of malignancy and reducing the psychological stress on the parents and the child. 1. Becher OJ, Souweidane M, Lavi E, Kramer K, Lis E, Marghoob AA, et al. Large congenital melanotic nevi in an extremity with neurocutaneous melanocytosis. Pediatr Dermatol 2009;26:79-82. 2. Greeley PW, Middleton AG, Curtin JW. Incidence of malignancy in giant pigmented nevi. Plast Reconstr Surg 1965;36:26-37. 3. Pilney FT, Broadbent TR, Woolf RM. Giant pigmented nevi of the face: Surgical management. Plast Reconstr Surg 1967;40:469-74. 4. Quaba AA, Wallace AF. The incidence of malignant melanoma (0 to 15 years of age) arising in large congenital nevocellular nevi. Plast Reconstr Surg 1986;78:174-9. 5. Dellon AL, Edelson RL, Chretien PB. Defining the malignant potential of the giant pigmented nevus. Plast Reconstr Surg 1976;57:611-7. 6. Rhodes AR, Wood WC, Sober AJ, Mihm MC. 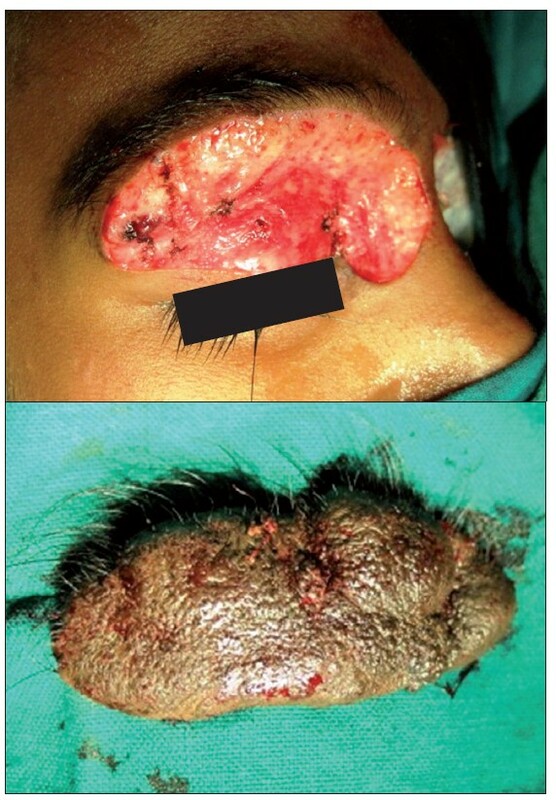 Nonepidermal origin of malignant melanoma associated with giant congenital nevocellular nevus. Plast Reconstr Surg 1981;67:782-90. 7. Kaplan EN. The risk of malignancy in large congenital nevi. Plast Reconstr Surg 1974;53:421-8. 8. Huemer GM. The value of full-thickness skin grafts in reconstruction of the periorbital region. Plast Reconstr Surg 2008;121:1857-8. 9. Bruce S, Bauer MD, Frank A, Vicari MD. An approach to excision of congenital giant pigmented nevi in infancy and early childhood, Plast Reconstr Surg 1988;82:1012-21. 10. Tannous ZS, Mihm MC Jr, Sober AJ, Duncan LM. Congenital melanocytic nevi: Clinical and histopathologic features, risk of melanoma, and clinical management. J Am Acad Dermatol 2005;52:197-203. 11. MacKie RM, English J, Aitchison TC, Fitzsimons CP, Wilson P. The number and distribution of benign pigmented moles (melanocytic naevi) in a healthy British population. Br J Dermatol 1985;13:167-74.